In early 2013 Kerfoot projects was involved in stage 1 of the St Joseph’s College Refurbishment works. This project consisted of the complete refurbishment of levels 2 & 3 in the more than 100 year old main building on campus. Kerfoot was awarded this project as a complete design and construct and our scope included Power distribution, communications infrastructure, lighting and intelligent lighting control as well as audio visual and security works. The Project had a strict time line to be meet, the team worked tirelessly with all stake holders to ensure all the clients requirements were meet. With the Success of stage 1 Kerfoot Projects was again engaged for the design and construct of stage 2 in 2014-2015. These works were to be completed within the same time line as the previous year and included the complete refurbishment of the year 12 doom rooms and a portion of the staff offices as well as a major power and communications upgrade for the main building. Utilising the same team as the previous year the Kerfoot Design and installation team had great success in completing the project within the client’s budget and on time. Stage 3 of the project was to take place in 2015-2016 and would include new staffing areas, common rooms and the refurbishment of bathrooms, kitchens and student dining halls with the last of the old electrical infrastructure to be remove and consolidated. This also included the refurbishment of the head masters office and meeting rooms. 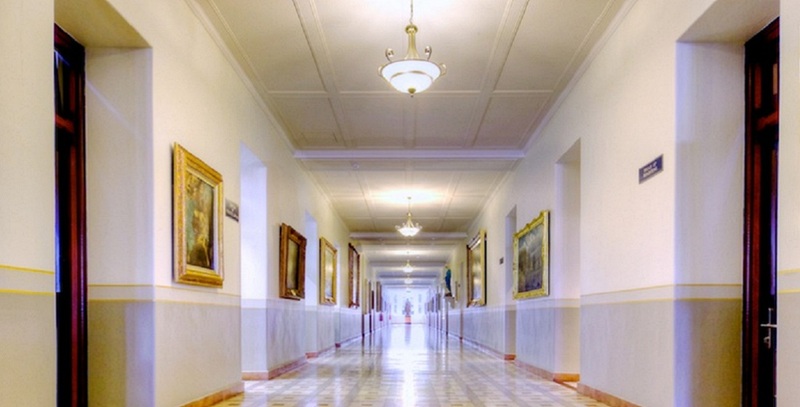 Lighting integrated with joinery was used to maintain the integrity of the heritage ceiling and also highlight its features, and the team at Kerfoot also utilised existing heritage lighting to keep the historic feel of the corridors. The main challenge faced at St Joseph’s College (apart from the specific time frame for works spanning the Christmas break & public holidays) was the fact the Main building is heritage listed – which creates some unique challenges. With walls typically 18inches of solid sandstone & being more than 100years old, the fixing of cabling and distribution boards needed careful planning. The process of penetrating these walls required extreme care and patience. The lighting design incorporated a great mix of existing heritage feel and modern energy efficient lighting and control. The installation of new cabling involved routes through voids and pathways that hadn’t seen the light of day for decades and created a rewarding sense of achievement for us, on what initially seemed an almost impossible task. The Kerfoot team again worked tirelessly to ensure the school was handed over on time and with full co-operation and assistance to other trades and complete satisfaction to the builder and client.